PS2 classic Ico is a stark, minimal affair. You hold a girl’s hand, you run around a bit. But it wasn’t always that way! Some recent file examination and translation work has uncovered that there was supposed to be a lot more story and exposition in the game. Both the Japanese and English versions of this title contain only 115 subtitle cards. Of these 115, a whopping 77 go unused – nearly seventy percent of the game’s text! These cuts eliminate vast swaths of exposition from the narrative, removing backstory, character development, and several major conflicts. Helpfully, GlitterBerri has put all the translated speech on her site, along with video footage timed to show the relevant quotes. 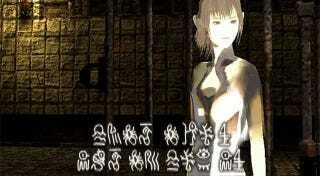 So if you want to grab a cup of tea and read up on Ico “lore”, head here and undo all that wonderfully bare world-building we’ve enjoyed for the past decade.